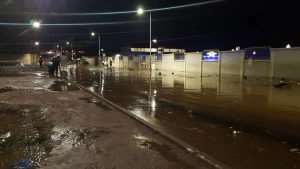 Some parts of the capital city got flooded after a downpour on Sunday evening. Some places including the Kwame Nkrumah Interchange, Kanashie, Avenor among others were all flooded. Running water spilt from chocked drains unto the roads at the Kwame Nkrumah Interchange and left pedestrians with no choice but to walk through the water which was around the knee level. Scores of vehicles were trapped in the water. The Accra Metropolitan Assembly has already begun desilting storm drains ahead of the rainy season to prevent flooding. As the rainy season approaches, many Ghanaians and most residents in Accra worry about flooding in the city.